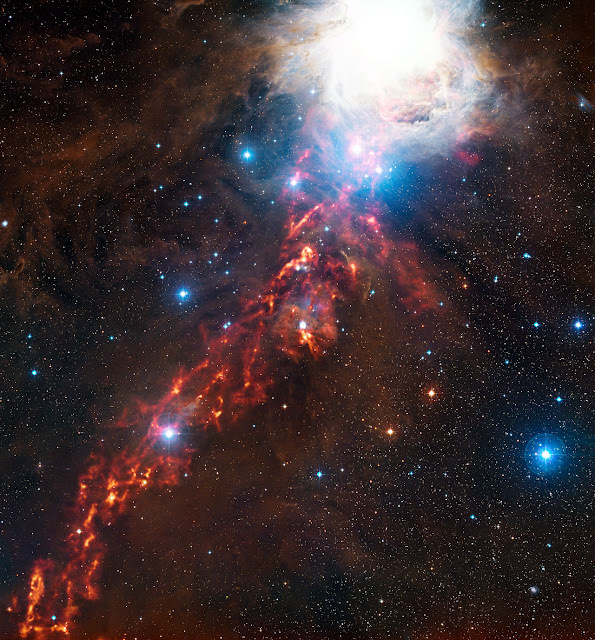 This dramatic new image of cosmic clouds in the constellation of Orion reveals what seems to be a fiery ribbon in the sky. This orange glow represents faint light coming from grains of cold interstellar dust, at wavelengths too long for human eyes to see. It was observed by the ESO-operated Atacama Pathfinder Experiment (APEX) in Chile. The Large Apex Bolometer Camera (LABOCA) operated at the ESO-operated Atacama Pathfinder Experiment (APEX) in Chile has imaged the invisible band of gas and dust at the Orion Molecular Cloud in the constellation Orion the Hunter. The constellation Orion is a well known formation of stars that can be seen throughout the world. The name Orion is derived from Greek mythology (Orion the Hunter). Zeus elevates him to the stars upon his death and is also mentioned in Homer's Odyssey where Odysseus sees his shade in the underworld. Astronomers have used these and other data from APEX along with images from ESA’s Herschel Space Observatory, to search the region of Orion for protostars — an early stage of star formation. They have so far been able to identify 15 objects that appeared much brighter at longer wavelengths than at shorter wavelengths. These newly discovered rare objects are probably among the youngest protostars ever found, bringing astronomers closer to witnessing the moment when a star begins to form.